Where are your favorite Maryland crab houses? The answer can be difficult, because many know the state of Maryland, and specifically the Eastern Shore, for its delicious seafood and fresh steamed crabs! Maryland blesses locals with countless crab-centric dining options, all different in their own way. Are you looking to pick crabs along the Potomac River at locations throughout Southern Maryland? Maybe purchase a bushel of crabs and take them to eat at a nearby beach along the Chesapeake? However you want to enjoy your fresh Maryland crabs, you’ll find something to satisfy your tastebuds. 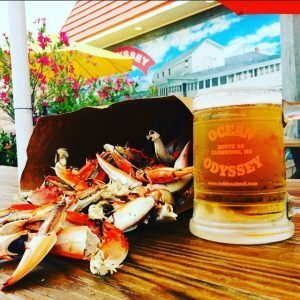 Ocean Odyssey serves as a great “pit stop” on your way to Ocean City, Maryland! Serving jumbo lump cakes and steamed crabs all year long, locals recognize it as one of the best Maryland crab houses in the state.